It has been awhile since I've had time to actually sit down and write a blog post about all that we've been up to lately, but I figured I would at least try to make a little bit of time and do an iPhone photo download... so, here's a quick peek (via photos) of all that we've been up to! I recently had a work trip to Arizona, and as much as I love going there, it reminded me how absolutely brutal the summer weather can be - it was h-o-t!! Truly, I stepped off the plane and felt like I might die. Texas is hot (and humid), but there is something about 115 degree heat that is just a different level! While in Arizona we had a team work event at Culinary Dropout, and it was great to get out of the office and have some fun - it makes me miss not being in the office every day! I enjoy traveling for work, but I really enjoy getting to come home to John and the pups... I totally soccer mom these dogs around town, ha! John and I recently purchased the Pottery Barn Kids Swivel Rocker and Recliner for baby Pray's nursery, and to say I love it would be an understatement - oh my goodness, it is SO comfortable! John and I are both tall and the back of this chair is the perfect height for proper neck and back support. The best part? 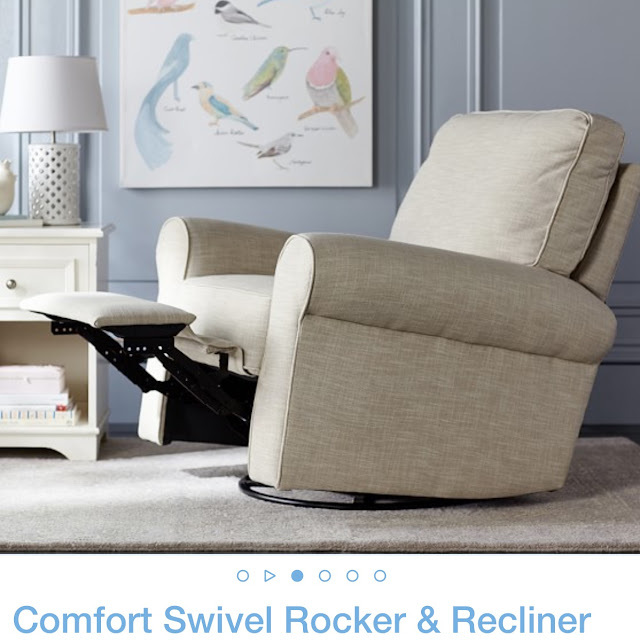 When you are done with the chair being a rocker, you can buy normal chair legs from Pottery Barn to transition it into a normal chair. I am so looking forward to rocking the babe to sleep and reading many books together in this chair. I recently took Lily to the vet and she is SUCH a character... most dogs are scared of the vet or get tense, but Lily just sprawls out on the floor and relaxes until it is her turn to be seen. We've been spending many days at the pool - it's been quite hot, but it's always refreshing to go for a swim after a day of yard work in the sun! In addition to pools, floating the rivers in the Texas hill country is a pretty big deal - the Guadalupe River gets slammed with people floating and swimming! We decided to take the dogs to join in on the fun, and it was pretty great... the water is clean water and the perfect temperature. I recently had to take my glucose tolerance test, and I am quite thankful to have it behind me! Was it terrible? No. But it certainly wasn't enjoyable. And thankfully I passed (I was joking with John that my body is a pro at processing sugar so this was no big deal!). John and Scout went paddle boarding on Boerne City Lake, and in the beginning Scout was a little confused about what was going on, but she quickly warmed up to the whole thing and quite enjoyed it! Summer dinners on the River Walk! John and I had our first baby class this past weekend... CPR! God willing we will never have to use what we learned, but it is good to always be prepared (or, as prepared as you can be, at least!). The reality of baby Pray's arrival is becoming more and more real every day! John told me that he wanted to take me for lunch at the Longhorn Cafe (which, at the time, I had never heard of); when we arrived I was a bit concerned... but oh my goodness - this dive has the most delicious greasy burgers ever. Like, you probably only want to eat this stuff once a year, but it's pretty dang tasty. Big spoon and little spoon... these two are TOO much sometimes, but when they actually sit down and relax, they can be pretty cute! You're looking so beautiful!! That bump is just precious!! Love the pics of your pups, especially the one of them in the car & of course the one at the vet! So cute! It's getting real! I agree four hours for a car seat class seems a bit much! That's crazy! Looks like you guys have been enjoying summer. You look gorgeous! You look amazing!!!! The Texas heat has been no joke... I do have to say that I prefer the dry heat of Arizona... but that's probably just my insanity talking. I had no idea those gliders could be converted into real chairs... that's awesome!! Genius, actually. A Shower for Baby Pray!